As an avid listener of BBC radio, particularly 6music and Radio 4, I always want to find out about what I’m listening to. I find the text provided by my DAB radio is both limited and slow. Sometimes it says something like “Why not tell us what you’d like to listen to blah blah” (or similar generic message, and not the currently playing track) which takes forever to scroll across my 30 character LCD display. The solution? 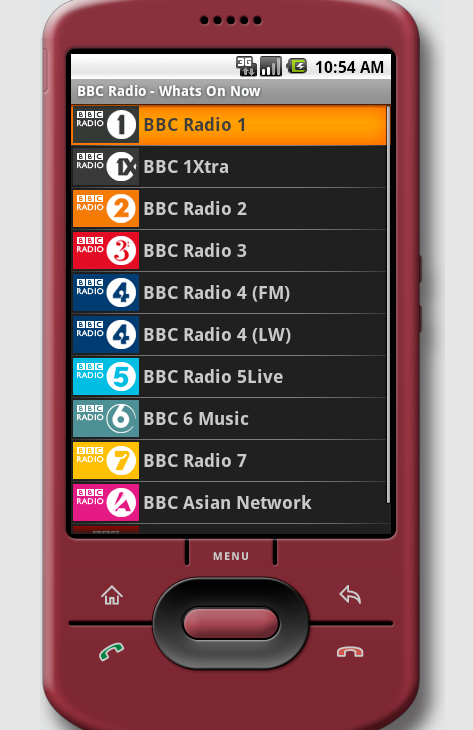 It’s called ‘BBC Radio What’s On’: on your Android phone you select from a list of available radio stations (see above). So, as you can see, a very simple application, but (arguably) very useful. As far as I am aware, no BBC web page provides this data in one place. The nearest to this is the new configurable BBC mobile homepage. 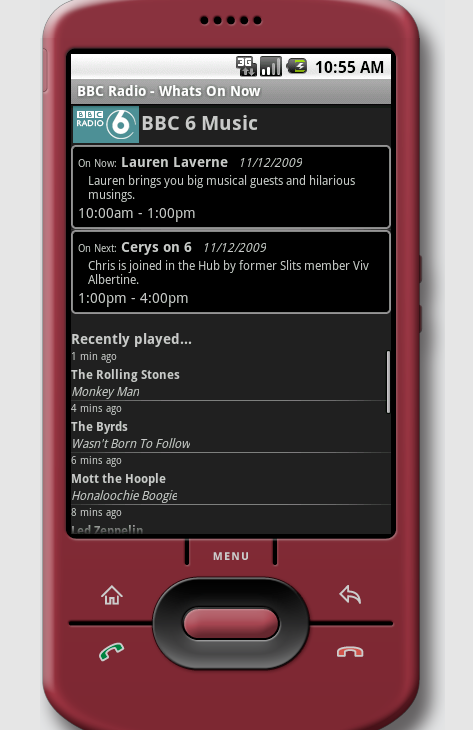 This allows the user to select radio stations to appear on the homepage indicating what show is on now, but no information about current tracks. Most people I have spoken to about Android development have been broadly positive. The speed and ease with which you can create and deploy a basic application on the emulator or a real phone is impressive. The tight integration with Eclipse makes development simple (performance issues aside, see below). Where I really found development problematic was when attempting to continue developing in the way I do when building web applications (i.e. using test-driven development and dependency injection). The problem here is that the android.jar supplied with the SDK is stubbed out with no implementation code. The solution that seems to be expected is that you should run your unit tests on the emulator or a real phone. Google have provided all the tools to do this; in fact it is an intrinsic part of the platform. To run a test on the emulator, the Eclipse plugin supplies a new run target ‘Android junit test’ (or simply install the application as normal and all unit tests will be run). This will load up the emulator, load the whole application onto the device, and run the test inside the Dalvik virtual machine*. Dalvik is the virtual machine which runs the Java platform on Android mobile devices. It runs applications which have been converted into a compact Dalvik Executable (.dex) format suitable for systems that are constrained in terms of memory and processor speed. Dalvik was written by Dan Bornstein, who named it after the fishing village of Dalvík in Eyjafjörður, Iceland, where some of his ancestors lived. 1) Import a mocking framework (e.g. mockito) into the project as an additional dependency. Any imported jars containing class files not compiled to Dalvik bytecode (most) will not work. Attempting to compile the source along with your project will not work either because most libraries will make extensive use of parts of the Java language not compatible with Dalvik: it uses its own library built on a subset of the Apache Harmony Java implementation. 2) Obtain a version of the android.jar where the utility libraries are not stubbed. Tried and failed, but please tell me if you find one. That the deployment environment (Dalvik) can place restrictions on the way in which code is tested is very frustrating. For the same reason, we also have a restriction on the libraries we can use as part of the application. The Android platform provides a very extensive array of libraries that make it easier to write most applications, particularly those with a web-focus. However, I feel one is missing that is central to creating applications using test-driven development and dependency injection: Spring. The inclusion of a lightweight IOC container would be an excellent addition to the Android platform. I have one final bugbear that I need to address. It is not important because it will be possible to fix, but it caused me more frustration than any other part of the development process. I am referring to the performance of Eclipse when using the Android SDK plugin. When Eclipse first loads and you are working with an Android project, the responsiveness is quite acceptable, but, for whatever reason, Eclipse increasingly slows. Use of the emulator is particularly detrimental and after around half an hour of development it can take 10-20seconds to switch between two file tabs. This is unacceptably slow and I find myself rebooting Eclipse and the emulator every half hour to alleviate the problem. Moan over. Based on the assumption that running tests on the emulator is too restrictive and slow, I wanted to come up with an approach that at least partially facilitates test-driven development. First, in Eclipse, we create a new Java (not Android) project call [ProjectName]Test which will be dependent on the main project and hold all the tests and test resources. By having a separate non-Android project we can add resources and code that do not conform to the Android project specification and satisfy the automatic validation. This project will be setup to use a standard JRE system library. Now we can add tests to this project that test the classes in the main project. This approach should work well, particularly for larger applications where more and more services perform an internal role where external libraries are not required. It’s also the best way to test domain objects which usually don’t need mocked services. Where this approach fails is where much of the code written is either using libraries or the parts of Android API, which would be common in small applications (such as ‘BBC Radio What’s On’). I am stumped regarding the best way to test code that uses the Android API. I have been reverting to testing on the emulator using Junit 3 and no mocking framework. The android.test.mock package may help with this, but seems to be just a bunch of stubbed out implementations for you to override as you require, so does not offer nearly as much power as a mocking framework. I have found an unconventional way of testing with the common libraries embedded in the Android platform. This approach is the best example of how awkward testing can be on Android. This test cause a “Stub!” exception when run as a unit test. This approach allowed me to quickly find several bugs in the RadioStationLoader before copying over the fixes to the original and deploying to the emulator. This is clearly not a sustainable approach but it provides a solution to developing code in a test-driven, dependency injected way. Finally, I needed a way to wire my services together to provide them to the main Activity classes. It’s hard to write applications using inversion of control without somewhere to invert the control to. In Java web applications this would be Spring . In Android, no such framework is available. This seems unfortunate as Spring (core) is lightweight (in many senses), even more so with a stripped-down alternative like Spring ME. Without such a framework, a developer is limited in leveraging the power of IOC architectures. My crude alternative was to configure my system and inject my dependencies in an ‘application context’ Java class. The one main recommendation that I would make as a result of this work would be for Google to provide an alternative android.jar that is stubbed as little as possible. This is particularly important where common open-source libraries have been integrated into the platform. This would make unit testing, and therefore test-driven development, much less painful. Oh, and Spring on Android would be nice too.